A friend Elliot Possey did mine, he will do others CSC members. I went to Elliot with 3 goals 1 - quiet, 2 - didn't ever want to see it at all, 3 - Zero problems of any kind. Elliot put up with me through the complete install (poor Elliot) as I approved everything. With that said he said he would do other CSC members but they must leave it in the AM and pick it up at the end of the day. Muffler is a Walker, must be offset for quiet per Eliott. His advice was no Flowmaster or Magnsflow if you want quiet. Exhaust tone is 100% acceptable to me, other option feel free to comment. I use 1 cat and it needs to be a heavy walled cat to last and work. During CM2011 I tested temps, my cat never measured a temp over 200°. Others had up to 479° the average of other was 300-400°. Floor temps were up 25° less the others and only a 5° difference between driver and passenger on my 80. I have never heard or seen that the exhaust has touch anywhere ever. O2 sensors are in the same place as the factory, never a code, remember NO problems. 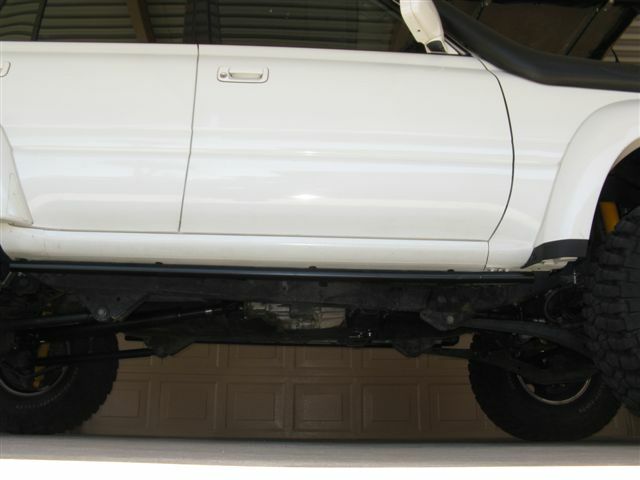 The install is very solid so far it has seen over 600+ off road miles and 2500 total miles. 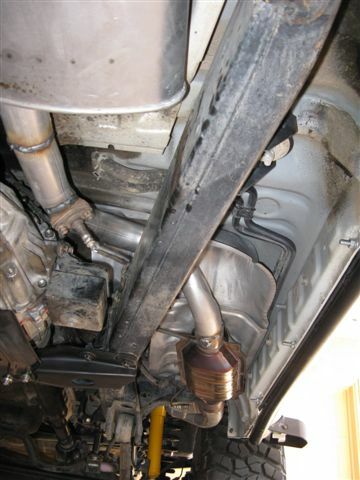 Cost for replacing from a shorten down pipe to the end side of the muffler will cost you $500. Im sure he can and will do whatever you want but I strongly suggest listening to his ideas if you want more. At first I had the ideas of 3" and this and that. After some consultation with Elliot I went with same size as OEM to meet my main goals. Remember I want reliability and quiet, so I listen and thankfully I did. I have no exhaust worries anymore. After several days of wheeling Moab and the surrounding area I can fully endorse this set-up. I smashed the main cross member, hit the transfer-case skid plate hard, scrapped the rock rails. I can tell without question the stock exhaust would have been a problem, possible not even there after Moab No rattles, no damage, no vibrations, no issues at all. I have zero concerns about my exhaust at this point forward when wheeling. I was with several other 80, early models, late models, stock exhaust, modded exhaust, single cats, and dual cat. A couple of times I took some IR temp readings of the passenger floor and the cats. My cat was at 200° max while others were double some as high as 465°. My floor temps saw about a 5-10° difference between drivers and passengers. While other 80 passenger temps were up to 25° hotter then mine. Keeping in mind my cat is 3/4" from my heat shield much less then stock. The muffler is as quiet if not more quiet then the stock muffler with about 10-15lbs less weight. All said one of the my best most effective mods.